Stylish Prince Charlie Highland jacket, the perfect choice for evening dress events and weddings. 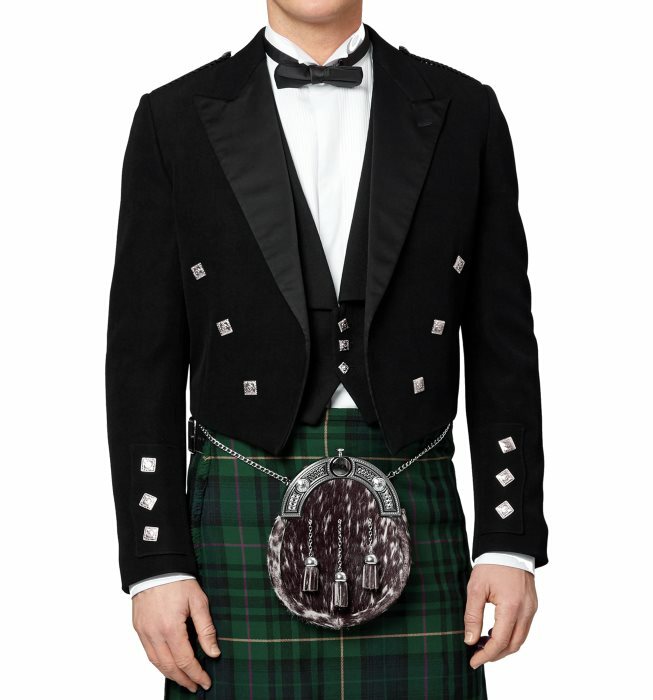 + The Prince Charlie jacket is a formal short cut evening jacket with short tails in the back. + Made of 65% vicuna wool / 35% polyester, and fully lined with satin. + Embellished with scallop cuffs and silver buttons as well as silver buttons in the double breast style from the front, the back tails also have scallop flaps and silver buttons. + Two internal pockets and thistle insignia on all buttons. + Please allow 4 weeks approx for delivery. Let us know if you do have a particular date in mind and we will do our best to meet it for you.